August 14, 2001, Troubrigde & Anweiler. Euxoa dodi is a small to medium-size Euxoa (FW length 12–16 mm) with light gray-tan forewings with a darker median area, even darker cell, double lines with components of equal strength, and dark-rimmed evenly pale-filled spots that is restricted to western Montana and flies during August and September. The forewing is light gray-tan, suffused with darker gray in the median area. The terminal area is more darker and more uniform gray, and the cell is filled with even darker brown-gray. The basal and antemedial lines are dark gray to black, double with similar components, filled with the ground color. The antemedial line is slightly irregular, more so near the posterior margin, and is oriented perpendicular to the posterior margin. The median line is gray, thin and relatively faint. The medial component of the postmedial line is darker than the lateral one, weakly scalloped, pulled basad on the costa, nearly perpendicular to the costa near the reniform spot, and angled 45° toward the base below the level of the cell. The subterminal line is slightly lighter than the ground color, slightly irregular. It is preceded by a brown-gray shade, dark on the costa and weak elsewhere. A thin dark terminal line is present at the base of the concolorous fringe. The orbicular and reniform spots are outlined in black and are moderately large, and are filled with a light shade of the ground color. The orbicular spot is round and the reniform spot is kidney-shaped. The clavioform spot is black, moderate-sized and narrow. The hindwing is very light tan-gray,with a gray veins, discal spot, and terminal line. The hindwing fringe is off-white with a gray base. The head and thorax are powdery gray-tan with a faint black line across the collar. A frontal tubercle is present. The male antenna is biserrate. Euxoa dodi is a member of the large subgenus Euxoa. This species can be identified by its western Montana distribution, small size, gray-brown color, darker median area, darker gray cell, and relatively large pale-brown-filled spots. It resembles Euxoa moerens and Euxoa infracta, two closely-related and similarly small species. 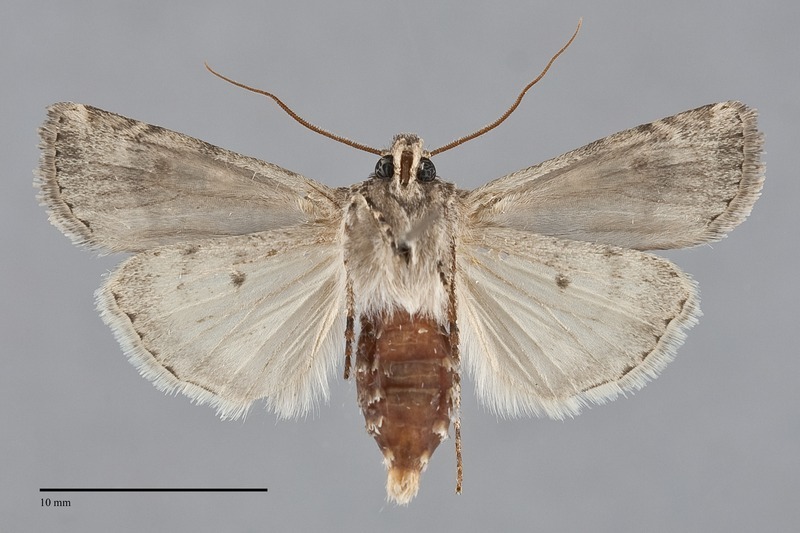 Euxoa infracta, a fairly widespread moth in our region, is much darker black-brown and copper colored with a dark gray hindwing. Euxoa moerens is only known from steppes of southeastern Oregon but occurs further north on the Great Plains and could potentially coexist with E. dodi in Montana. It is slightly lighter-colored on both wings and has a more diffuse pattern on the forewing, usually with a darker cell. 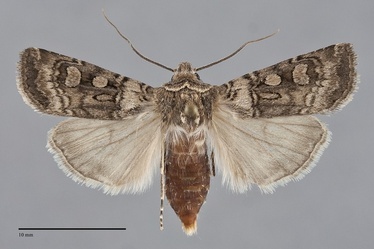 Euxoa declarata is similar in having a dark cell on a brown forewing but is usually larger, darker purplish brown, and has less contrasting filling of its forewing spots than E. dodi. This species flies over dry short-grass prairies on the Great Plains and in open pine forests in the Rocky Mountains. This species is only known from western Montana in the Northwest. It might also occur in extreme eastern Idaho. The range of E. dodi extends from southern Alberta and the western Dakotas south to Colorado, northern New Mexico, northeastern Arizona, and western Texas. The flight period of this moth extends from mid-August through September throughout its range. It is nocturnal and comes to lights.